"Real horror fans have watched vampires systematically turned into wimpy fodder for years now. It's time to fight back" said Niles. "I'm happy to be working with IDW on the Sparkles for Blood event. Hopefully, working together we can put an end to this nightmare." The audacious exchanges can be made this weekend at IDW's booth at Comic-Con International in San Diego. 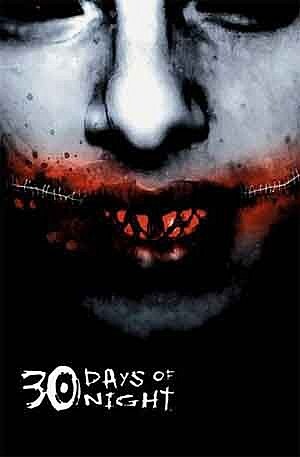 30 Days of Night is an especially bloody and enduringly popular vampire graphic novel (and film franchise) in which the vicious blood-sucking creatures migrate to the town of Barrow, Alaska, which routinely goes without sunlight for as many of 30 days, facilitating a vampire feeding frenzy. Twilight, on the other hand, is about how awesome it is to be a vampire. There is no downside: they can travel in the daylight, they get hotter, they're more talented, they know everything, they can read minds and they can fly. They are quite literally the master race and it doesn't make any sense why they don't just take over because they're clearly better than humans. "Recently, vampires in pop culture have started to swing back to the romanticized vamps of other literature and films before 30 Days of Night," said IDW chief creative officer, Chris Ryall. "In some cases, they're even being treated more as chaste immortal teenagers than as the murderous creatures that they are. 'Sparkles for Blood' will remind everyone that vampires are creatures of the night, not of the twilight." While ComicsAlliance quite naturally does not, cannot and would never condone or participate in any sort of nerd-on-nerd aggression (how dare you), it has to be said that the scheme devised by Niles, Ryall and IDW Director of Retail Marketing Dirk Wood is admirable for its bravado. Of course, we will investigate what becomes of the Twilight books people turn in to booth #2643 at Comic-Con. "We may need a forklift at the end of the show, for all the Twilight books," says Dirk Wood, IDW's director of retail marketing. "But it will be worth it. It's time to start scaring people again."